Looks like there might be trouble in paradise for HTC fans. Nordic Hardware’s tests have proven that the new HTC Sensation also suffers from the same dreaded death grip as the iPhone 4 but this time it also affects the Bluetooth and Wi-Fi connectivity of the phone. The problematic area is the back cover. 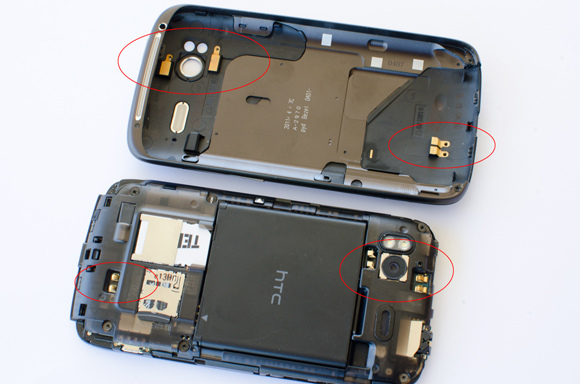 As we discovered a few days back, the Sensation does not have a true unibody design as HTC claims it does but instead uses a large removable battery cover which is mostly made out of metal and has plastic areas that work as antennas. Unfortunately, when these pieces are covered by your hand, there is a substantial drop in the performance of the radio units within the device, particularly of the Bluetooth and Wi-Fi radios. As you can see in the first video below, keeping the device flat on your palm makes the Bluetooth audio stream stutter. In case of Wi-Fi, it makes the weaker hotspots disappear from the list of available hotspots as their signal strength is no longer strong enough to penetrate through your hands. Admittedly, the problem may not be as severe when holding the device normally in portrait mode, however, in landscape mode you will have a hard time avoiding the antennas on the back. Now a certain amount of attenuation is expected when you cover the antennas and manufacturers always put a warning in their user guides on the (im)proper way to hold the phone. But in this case the attenuation is way too high and is greatly impacting the performance, and thus the credibility, of the device. We would like to know if any users of this phone are having similar problems with this phone. If so, do let us know. Otherwise it could just be a case of a faulty review sample received by Nordic Hardware. We do hope this is not a new trend that is starting among new generation handsets. After losing most of our battery life, we don't want to lose our signal strength as well. Update: We saw some users suggesting that putting on a cover on the Sensation might solve the death grip issue as it does on the iPhone 4. The thing is, the reason a cover works on the iPhone 4 is because it prevents the user from bridging the gap on the antennas on the side and shorting them. On the Sensation, it happens because you are physically blocking the antenna, thus reducing it's effectiveness. So in case of the Sensation, a cover might just make things worse.